Using NASA’s Chandra X-ray Observatory, astronomers have discovered new details about the remains of a supernova that is the most recent, in Earth’s time frame, known to have occurred in the Milky Way. 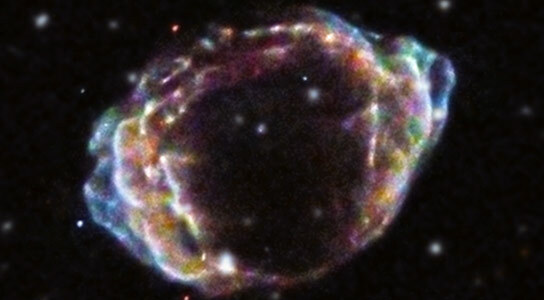 Supernova remnant G1.9+0.3 would have been visible from Earth a little more than a hundred years ago and is located about 28,000 light years from Earth. Astronomers estimate that a star explodes as a supernova in our Galaxy, on average, about twice per century. In 2008, a team of scientists announced they discovered the remains of a supernova that is the most recent, in Earth’s time frame, known to have occurred in the Milky Way. The explosion would have been visible from Earth a little more than a hundred years ago if it had not been heavily obscured by dust and gas. Its likely location is about 28,000 light years from Earth near the center of the Milky Way. A long observation equivalent to more than 11 days of observations of its debris field, now known as the supernova remnant G1.9+0.3, with NASA’s Chandra X-ray Observatory is providing new details about this important event. The Chandra data show that most of the X-ray emission is “synchrotron radiation,” produced by extremely energetic electrons accelerated in the rapidly expanding blast wave of the supernova. This emission gives information about the origin of cosmic rays – energetic particles that constantly strike the Earth’s atmosphere – but not much information about Type Ia supernovas. Another exceptional feature of this remnant is that iron, which is expected to form deep in the doomed star’s interior and move relatively slowly, is found far from the center and is moving at extremely high speeds of over 3.8 million miles per hour. The iron is mixed with lighter elements expected to form further out in the star. 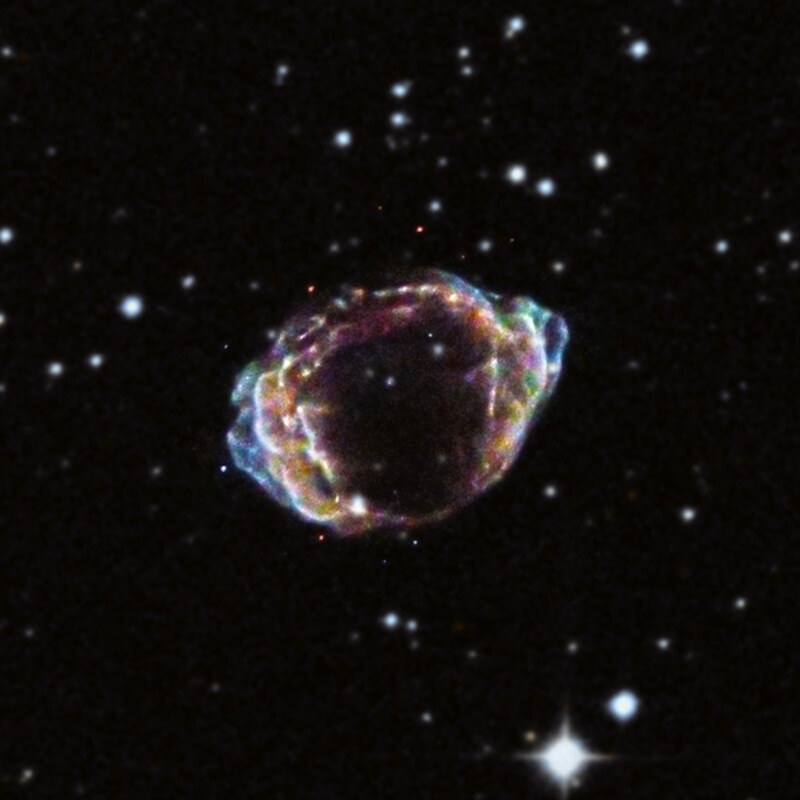 Because of the uneven distribution of the remnant’s debris and their extreme velocities, the researchers conclude that the original supernova explosion also had very unusual properties. That is, the explosion itself must have been highly non-uniform and unusually energetic. By comparing the properties of the remnant with theoretical models, the researchers found hints about the explosion mechanism. Their favorite concept for what happened in G1.9+0.3 is a “delayed detonation”, where the explosion occurs in two different phases. First, nuclear reactions occur in a slowly expanding wavefront, producing iron and similar elements. The energy from these reactions causes the star to expand, changing its density and allowing a much faster-moving detonation front of nuclear reactions to occur. If the explosion were highly asymmetric, then there should be large variations in expansion rate in different parts of the remnant. These should be measurable with future observations with X-rays using Chandra and radio waves with the NSF’s Karl G. Jansky Very Large Array. A paper describing these results is available online and will be published in the July 1, 2013 issue of The Astrophysical Journal Letters. The first author is Kazimierz Borkowski of North Carolina State University (NCSU), in Raleigh, North Carolina and his co-authors are Stephen Reynolds, also of NCSU; Una Hwang from NASA’s Goddard Space Flight Center (GSFC) in Greenbelt, Maryland; David Green from Cavendish Laboratory in Cambridge, UK; Robert Petre, also from GSFC; Kalyani Krishnamurthy from Duke University in Durham, North Carolina and Rebecca Willett, also from Duke University. 1 Comment on "Chandra Reveals New Details About the Remains of Supernova Remnant G1.9+0.3"
This makes the original explosion the most recent supernova in the Galaxy, as measured in Earth’s time-frame (referring to when events are observable at Earth). Equivalently, this is the youngest known supernova remnant in the Galaxy (140 years old), easily beating the previous record of about 330 years for Cassiopeia A. The rapid expansion and young age for G1.9 0.3 was recently confirmed by a new VLA image obtained in early 2008.